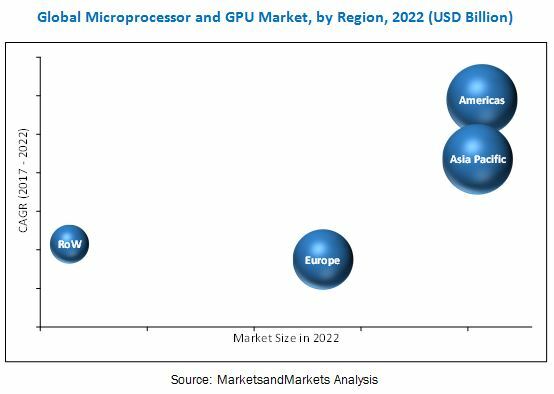 [189 Pages Report] The microprocessor and GPU market is expected to be worth USD 83.69 Billion by 2022 from USD 73.98 Billion in 2016, at a CAGR of 2.2% between 2017 and 2022. The base year considered for the study is 2016, and the forecast period is between 2017 and 2022. The objective of the report is to provide a detailed analysis of the market based on architecture, application, and geography. The report also provides information regarding the major factors influencing the growth of the microprocessor and GPU market (drivers, restraints, opportunities, industry-specific challenges, burning issues, and winning imperatives), along with the detailed value chain. In addition, the key players in the microprocessor and GPU market are strategically profiled, and their market rank and core competencies are comprehensively analyzed, along with detailing the competitive landscape for market players and describing the new product launches, acquisitions, partnerships, expansions, agreements, awards, and collaborations in the market. This research study involves the extensive use of secondary sources, directories, and databases (such as annual reports, press releases, journals, company websites, paid databases, such as Science Direct, Statista, Elsevier, SEMI, and WSTS) to identify and collect information useful for this study. The entire procedure includes the study of the financial reports of the top market players. After arriving at the overall market size, the total market has been split into several segments and subsegments and confirmed with the key industry experts such as CEOs, VPs, directors, and marketing executives. 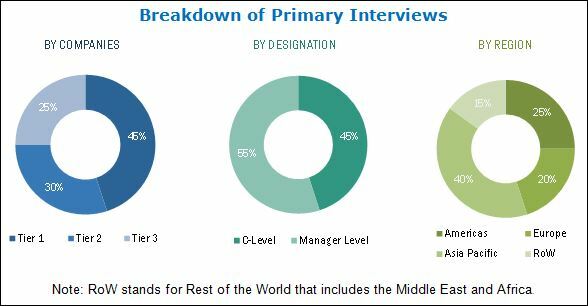 The figure below shows the breakdown of primaries conducted during the research study on the basis of the company type and designation. The microprocessor and GPU market comprises business entities such as Advanced Micro Devices, Inc. (US), IBM Corporation (US), Intel Corporation (US), Texas Instruments Incorporated (US), Nvidia Corporation (US), NXP Semiconductors (Netherlands), Samsung Electronics (South Korea), MediaTek Inc. (Taiwan), Qualcomm Technologies Incorporated (US), Renesas Electronics Corporation (Japan), Broadcom Limited (US), Microchip Technology Incorporated (US), Marvell Technology Group, Ltd (US), Toshiba (Japan), Spreadtrum Communications Inc. (China), and Allwinner Technology Co., Ltd. (China). Automotive applications such as infotainment systems and ADAS are being widely adopted by car manufacturers. The growing demand of unmanned aerial vehicles (UAVs) or drones in the entertainment application further drives the growth of the microprocessor market. Apart from automotive and drone applications, the demand for wearable devices such as smartwatches would also propel the market growth during the forecast period. x86-architecture held the largest share of the microprocessor market in 2016. The x86 architecture is used in desktops, laptops, and servers, which are the top three segments for value-based businesses. This is because of the higher price associated with the microprocessors used in these applications. On the other hand, low-cost ARM processors are widely used in portable devices, leading to their higher volume-based business. The APAC region held the largest share of the overall microprocessor and GPU market in 2016 owing to the widespread penetration of consumer electronics in this region. The Americas is the second-largest market in 2016 and is expected to grow owing to the demand for server attached GPU and ADAS applications. However, the availability of low-cost solutions and the preference toward portable devices over larger device are affecting the revenue and profit margin of the company. Though the volume business would remain the same, the overall market size is affected by the availability of low-cost solutions to consumers. Dominant players in the microprocessor market include Intel Corporation (US), Qualcomm Technologies, Inc. (US), Advanced Micro Devices, Inc. (US), and Samsung (South Korea), Nvidia Corporation (US), NXP Semiconductors (UK), Apple Inc. (US), Broadcom (US), IBM Corporation (US), MediaTek Inc. (Taiwan), Spreadtrum Communications Inc. (China), Texas Instruments Incorporated (US), Renesas Electronics Corporation (Japan), Marvell (UK), Amlogic (CA) Co., Inc. (US), Ambarella (US), and Actions Technology (China). These players adopted various strategies such as new product developments, acquisitions, partnerships, expansions, agreements, and contracts to achieve growth in the market. *Top 25 Cmpanies Analysed for This Study are - Actions Technology; Allwinner Technology Co., Ltd. ; Ambarella; Advanced Micro Devices, Inc; Amlogic(Ca)Co., Inc.; Applied Micro Circuits Corporation; Broadcom; Cavium; Fujitsu; Hisilicon Technologies Co., Ltd; IBM Corporation; Intel Corporation; Marvell; MediaTek Inc; Microchip Technology Inc. ; NXP Semiconductors; Oracle; Qualcomm Technologies, Inc; Renesas Electronics Corporation; Fuzhou Rockchip Electronics Co., Ltd; Samsung; Spreadtrum Communications Inc.; Texas Instruments Incorporated; Toshiba Corporation. 12.11 Marvell Technology Group, Ltd.
12.13 Samsung Electronics Co., Ltd.
12.17 Allwinner Technology Co., Ltd.